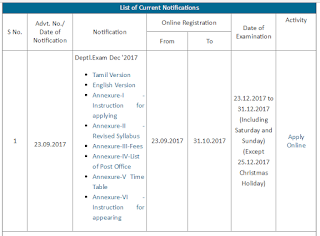 23-09-2017 : TNPSC Departmental Exam December 2017 Notification is published at TNPSC Official Website http://www.tnpsc.gov.in/latest-notification_deptl.html. Registration Fee : Registration Fee Rs. 30/- along with postal charge of Rs.12/- to be included to the total amount of examination fee. Results will be published at TNPSC Website www.tnpsc.gov.in during 7th August 2017 to 16th August 2017. 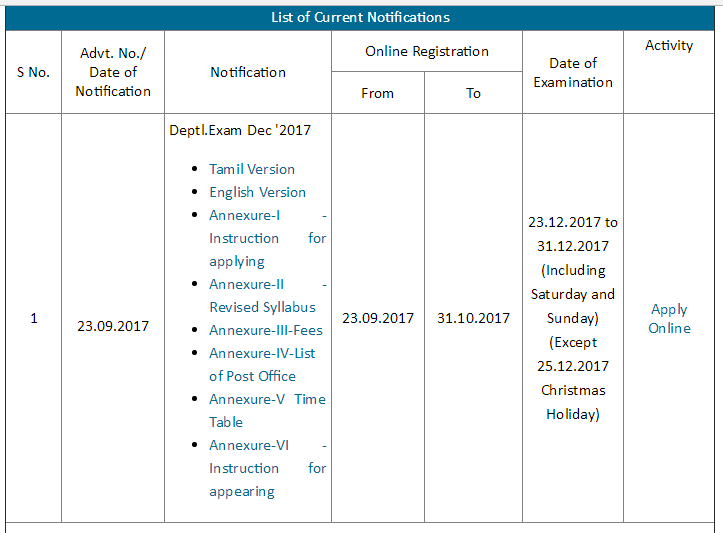 Timings for Written Examinations:- The Forenoon session of the TNPSC Departmental Exam December 2016 will be conducted from 9.00 a.m. and the Afternoon session will be conducted from 2-30 p.m. Exam Fee : TNPSC Department Exam December 2016 Registration Fee Rs.30/- along with postal charge of Rs.12/- to be included to the total amount of examination fee for TNPSC Departmental Exam. How to Apply for TNPSC Departmental Exam May 2016 ? TNPSC Department Exams 2016 Applications can be made only through online mode from the TNPSC Official Website . Visit http://tnpsconline.tn.nic.in/ for more information about the TNPSC Departmental examination December 2016. TNPSC Departmental Exam May 2016 Notification Published. 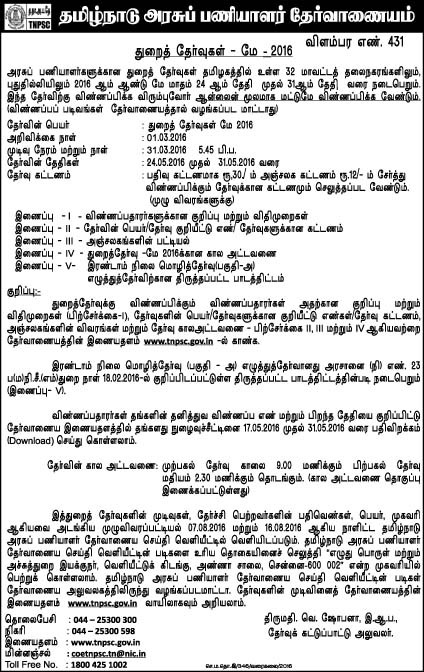 Last Date to Apply online from TNPSC Website is extended to 11th April 2016. Visit http://tnpsconline.tn.nic.in/ to apply online. 05-04-2016 : TNPSC Departmental Exam December 2015 Result is published for all papers. The result can be seen from the following link from TNPSC Official Website. 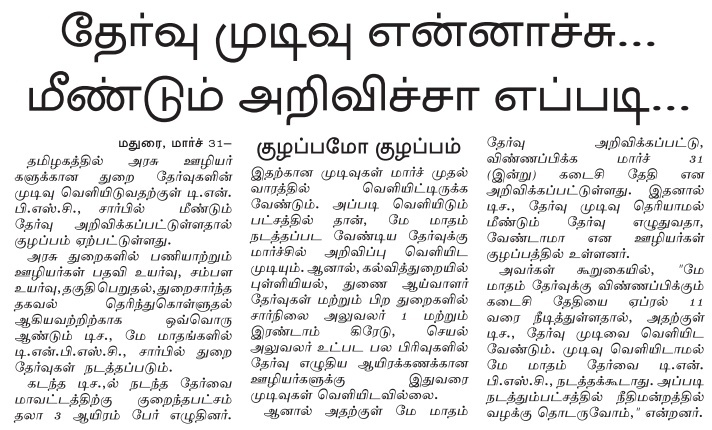 31-03-2016 : There is a latest news in today's Dinamalar Newspaper about the TNPSC Departmental Examination May 2016. 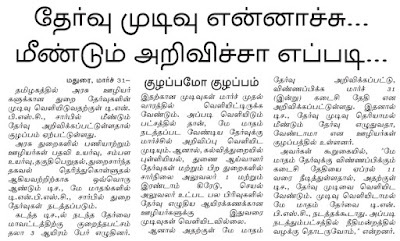 The newspaper article claims that the TNPSC Departmental Examination May 2016 notification has been published before the publication of complete results. The results of some papers in the TNPSC Departmental Examination December 2015 are yet to be published by the Tamil Nadu Public Service Commission . It also informs, candidates expect the result of the remaining papers at least before the last date of online application ( 11th April 2016). 17-03-2016 : TNPSC Departmental Exam December 2015 Result Published. Check your results soon from TNPSC Official Website www.tnpsc.gov.in or from the following direct link. 16-12-2015 : TNPSC Departmental Exam Hall Ticket Published for December 2015 Exam. The TNPSC Departmental Examination 2015 Call Letter can be downloaded from the TNPSC Official Website www.tnpsc.gov.in. Note : The TNPSC Departmental Exam December 2015 examination date has been proponed to 23.12.2015 due to Milad un-Nabi. . Please visit TNPSC Official Website www.tnpsc.gov.in for more information. 30-09-2015 : Today (30-09-2015 5.45 pm) is the last date to apply online. If you have not applied for TNPSC Departmental Exam December 2015, hurry up, apply soon. TNPSC Departmental Exam December 2014 Result Published . Check it from the TNPSC Official Website www.tnpsc.gov.in. Tamilnadu Public Service Commission (TNPSC) conducts Departmental Exams twice in a year (usually in the months of May and December ) as a qualifying examination for the promotion of government staff, and teachers in their departments. Now the TNPSC has published notifications for the TNPSC Department Exam May 2015.